Although hardly anyone likes their methods, the controversial airline Ryanair is the absolute leader at Malaga airport, to the point that in the first ten months of this year it has reached a market share of 21%. 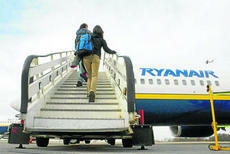 Put another way, one of every five passengers passing through Malaga has embarked on a plane of the Irish low-cost airline. When the eccentric company president Michael O’Leary launched in December 2009, dressed as Santa Claus, the Ryanair base at Malaga airport coinciding with the opening of Terminal 3, he predicted that Ryanair would become the first airline in 2010 and surpass 2 million passengers. The results not only proved him right, but even were somewhat higher (2,113,374 passengers). This year Ryanair’s superiority is being overwhelming and, according to official data from Aena, between January and October has reached 2.5 million passengers taking one million customers from the second largest company in Malaga, Easyjet. The key to success has been, firstly, to offer very cheap rates and, secondly, having a large number of picturesque destinations. With Ryanair you can fly directly from Malaga to Billund (Denmark), Tampere (Finland), Haugesund (Norway) and Krakow (Poland) among many others. The first six companies at Malaga airport are low cost, while traditional companies occupy more secondary positions. This new model is required by travelers who claim to pay as little as possible. It is unknown whether the strategy will be successful or not but what is clear is that the airport has continued to win passengers since it opened the Terminal 3.